Saving money can be hard, but it doesn’t have to be. It depends on how you’re doing it. Let’s talk about how to save money easily. Most of us aren’t saving money just for saving money sake. You’re stacking up money for a reason. Perhaps you’re working on a rainy day pile aka an emergency fund. Or you have a short-term goal like a vacation or a down payment on a car. Maybe it’s a long-term goal like retirement or tuition payments. Whatever the reason, you’re working on saving money in order to then DO something with that money. Even knowing that, saving can be hard because you have to constantly ignore current luxuries or opportunities to spend money for future gain. Remembering to take care of your future self in the moment can be difficult. It’s important to take every opportunity to remove the discipline to saving money. The main way to do this is through automation. This way you don’t even have to think about it. This is why it’s so great. You link Digit to your checking account. It will analyze your spending behavior and determine how much you’re able to save. It will then automatically pull small amounts of money (the amount it already determined you can spare) from your checking account. Don’t worry about going over, it’s small amounts and they have a no overdraft guarantee. Also, every few days they analyze your spending again to see if there have been any changes. They’ll then adjust the amounts they are saving for you. No need to try and remember to decrease your savings amount. This removes you and your discipline as a barrier to saving money. I’ve been using it for several months and I sometimes forget I’m using it until Digit sends me an update about how much I’ve saved. I can transfer the money back to my bank account whenever I want and how many times I want. No transfer fees! It is incredibly easy to use. Oh and the money is safe as it is FDIC insured up to $250,000. The same as your bank. 1) Click here to go and sign up. 2) Connect your bank account. 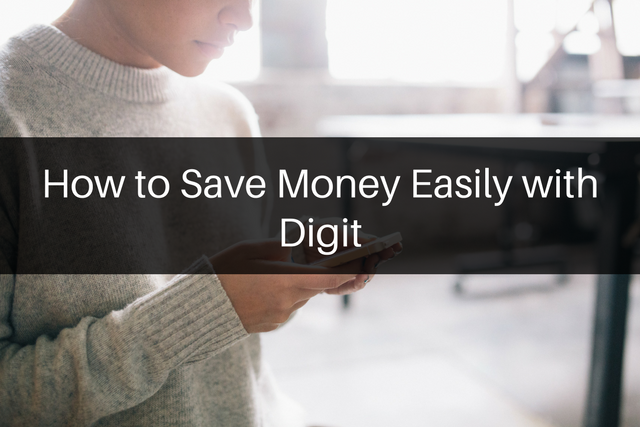 3) After analyzing your spending habits and income, Digit will transfer a small amount of money every few days. After using Digit for several months, I can say I genuinely like it and haven’t encountered any downsides. This is why I’m confident in referring it to you. I am an affiliate of Digit and earn a commission on referrals. However, I would never recommend anything to you that I wouldn’t use myself or wouldn’t recommend to my own family. I only recommend things that I believe will be helpful and useful.